Some of my friends who are not as into birds as others look at fall birding as a tad boring–birds in various shades of brown from warblers to sparrows to shorebirds to raptors. But ducks take it up a notch with their colorful plumage. 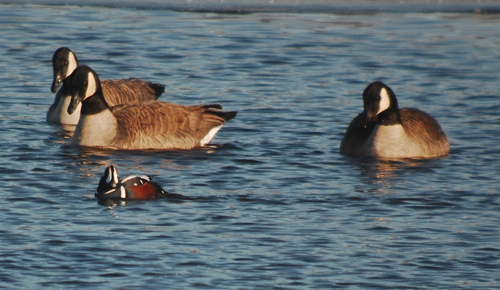 You can glass over what at first appears to be all Ring-necked Ducks and then find Goldeneye and a Redhead. Many have yellow eyes that give them a crazed look, especially when they start splashing and diving for food. It’s a great way to spend a morning or afternoon, as a matter of fact, I’m meeting a girlfriend after work today for some gossip and duck action. The last two weeks have really pushed the waterfowl through. I get 2 different perspectives, one from a plane, the other on the ground. Canada Geese on the Upper Mississippi counted this week. These are Canada Geese that we flew over on the river on Monday. I’m part of a joint operation with US Fish & Wildlife, Minnesota DNR and the National Park Service to survey waterfowl and Bald Eagle use of the upper Mississippi River during fall migration. It’s a challenging task but it gives you a chance to see ducks and other water birds in a unique way. The id is hard! Many birders can cruise down the highway at 60 – 70 miles per hour and pick out hawks and duck. However, flying 100 feet above the ducks at 100 miles per hour and looking down on them is tough, especially when you hit a flock of 5000 birds with 7 different species mixed in. Our surveys this fall appear to have lower numbers than previous surveys. We’re not sure of the full reason, we believe the fall flooding of the Upper Mississippi might be part of it. This year, the area has experienced 2 of the 10 highest flood stages in recorded history. The water was so high and churned up so much vegetation in September, we found many vegetation eating birds like American Coots and Gadwall in pools where we typically find Goldeneye and Common Mergansers. We also found fewer Double-crested Cormorants and American White Pelicans because many of their roosting logs were submerged. We’ll keep counting until the pools freeze up and I’ll be curious to see how the numbers are for the big merganser push in November. You can keep track of what we see at the US Fish & Wildlife Fall Flight Surveys. We update as soon as we can after a flight and you can also see past flight numbers. Even though the numbers of waterfowl appear to be down on the surveys, great and unusual waterfowl has been reported this week. In the Twin Cities metro area we’ve had reports of Black Scoters and a Long-tailed Duck–which are crazy looking waterfowl with a hint of Dr. Seuss in their body shape. I’m personally looking forward to later this month. We have a spot in the southeast metro area where the Mississippi River meets with the St. Croix River, right on the Minnesota/Wisconsin border that has hosted a male Harlequin Duck for the last three years. It is presumably the same bird, but since it’s not banded, we can’t say that for certainty. But I love the idea of a Harlequin that is seeking out a new migratory route and apparently thriving. So, grab your bins, grab your scope and scan those lakes in rivers in the Midwest. We’ve got lots of Bufflehead and Canvasbacks stacking up in the Upper Mississippi pools and they will soon be heading your way! Sharon Stiteler was given a Peterson Field Guide to Birds when she was seven years old and snapped. She loves birds - it’s just the way she’s wired. Since 1997, she has made it her goal to get paid to go birding. She runs the popular birding blog, Birdchick.com, and has been in The Wall Street Journal, The New York Times, and on NBC Nightly News as well as making regular appearances on Twin Cities’ TV and radio stations. She’s a professional speaker and story-teller and her writing can be found in several publications including WildBird Magazine, Outdoor News, and Birding Business. She wrote the books 1001 Secrets Every Birder Should Know, Disapproving Rabbits and City Birds/Country Birds. When she’s not digiscoping, tweeting or banding birds, she’s a part-time park ranger and award-winning beekeeper. Great going, Sharon! Nice to see you here, too! Thanks for the information! Are any of these locations smaller pools that you can get somewhat close to? I went to the old Cedar bridge over the MN River hoping to see Pintail and some of the ducks you mentioned. But we couldn’t get even close to any of them to really see them.. I love them all but the harlequins just look like a wood carver’s finished piece. @Chad–Some of the areas are closed but if you can do a day trip down to Trempeleau (on the Wisconsin side)–there are some great duck opportunities. We actually found some pintail there doing a ground survey on Monday. My guess is that over the next week or two, pools 6 & 7 are going to be the most action packed areas–especially Brownsville. Have you gone for the long-tailed duck on Vadnais? We got last night fairly close to shore. Sounds like an exciting way to survey birds. Ducks are so beautiful- I am soooo lookng forward to getting reaquainted with a slough of waterfowl on the Niagara River when I head back home for Thanksgiving. Great thanks for the info. That’s a bit of a drive for me but I might have to plan a trip down that way! I haven’t been up to the Vadnais area yet, but if it’s still around this weekend I think I will. Sharon, I can’t imagine how difficult that is to ID waterfowl from a plane flying that fast. I’m sure your survey data will help with conservation efforts to assess the state of the birds on the Mississippi. 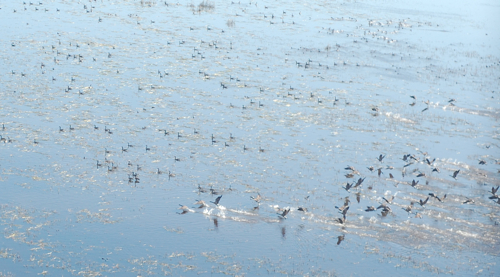 Living on the Pacific Flyway, I love the approach of winter and the waterfowl migration! It’s a great time of year to see ducks and other waterfowl and shorebirds. Oh, Yeah, I’m Going to Ecuador! Where Are You Birding This Third Weekend of August 2009?